The Layer Properties editor or view lets you adjust the properties of a layer in the Timeline view or a node in the Node view. The Layer Properties can be viewed as a floating window or as a view (docked). Double-click on a layer in the Timeline view or a node in the Node view. 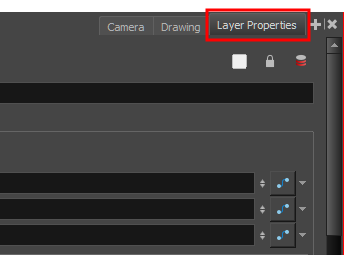 Right-click on a layer in the Timeline view or a node in the Node view and select Layer Properties. Select a layer in the Timeline view or a node in the Node view and press Shift + E.
‣ Select the view you want to add from Windows > Layer Properties. ‣ In the top-right corner of a view, click the Add View button and select Layer Properties from the list. 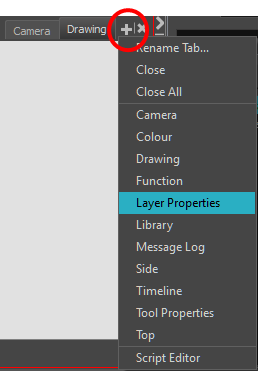 By default, the Layer Properties view appears as a tab. 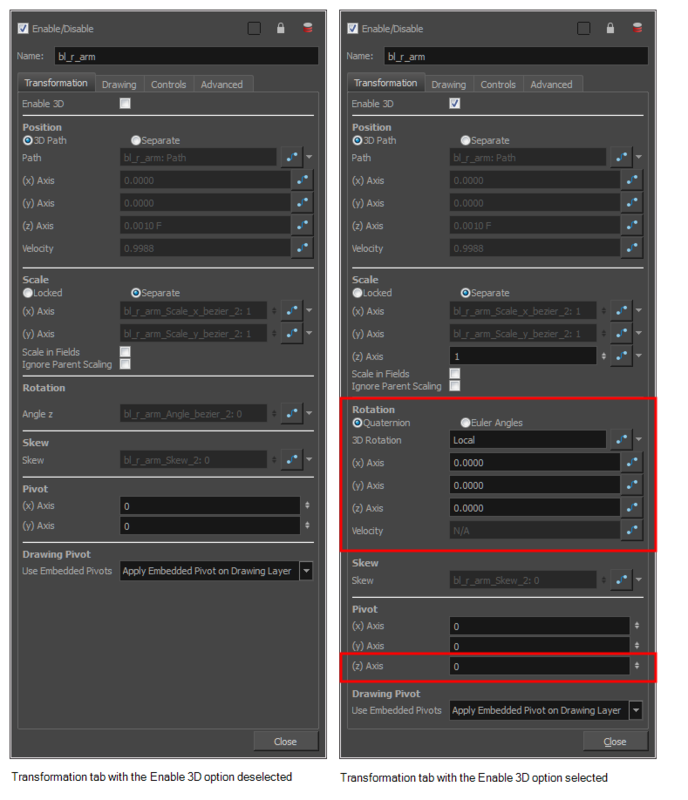 When the Enable 3D option is selected, additional parameters appear in the Rotation and Pivot sections to rotate objects on 3 axis in the 3D space. Enable 3D Displays additional parameters for working with 3D objects. The Drawing pivot is contained within each drawing. In one layer, each drawing can have its own pivot. If you have many different views of a character within one layer, the pivot positions can be different and the animation will adjust to the pivot. The Drawing pivot can also be referred to as embedded pivot. If you are not mixing different views within the same layers or are using pegs to animate your layers, it is recommended to use the permanent pivot. You can set a different pivot for each one of your drawings. For example, if you have a series of drawings from different views, they are not likely to rotate from the same location. In that case, you can set a different pivot for these drawings by using the Drawing Pivot tool—see Drawing Pivot Tool Properties. The Symbol pivot is similar to the Drawing pivot. Each symbol cell can have its own pivot and act the same as the Drawing pivot. The Symbol pivot can also be referred to as embedded pivot. Inside a symbol, each drawing can have its own pivot. If you are not mixing different views within the same layers or are using pegs to animate your layers, it is recommended to use the Peg pivot. 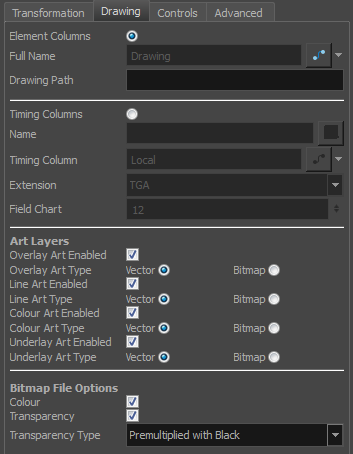 The Drawing tab contains parameters for the element and timing columns, designating art layers, and setting bitmap options. Full Name: Select which element to connect to the node from the list of elements that already exist in your scene. Name: Path to the file you want to link to. Timing Column: Link to the column that contains the desired timing. Extension: When linking to a background file, enter its file name extension. Field Chart: If you are importing traditional animation, select the size of the paper on which the animation was drawn. Lets you set a maximum and minimum rotation angle for a drawing. This option is used mainly for a cut-out character when you do not want an elbow to bend too far in or out. Enable Min/Max Angle: Activates the minimum and maximum angle constraints. Min Angle: Type the minimum angle you want the drawing to rotate too. Max Angle: Type the maximum angle you want the drawing to rotate too. 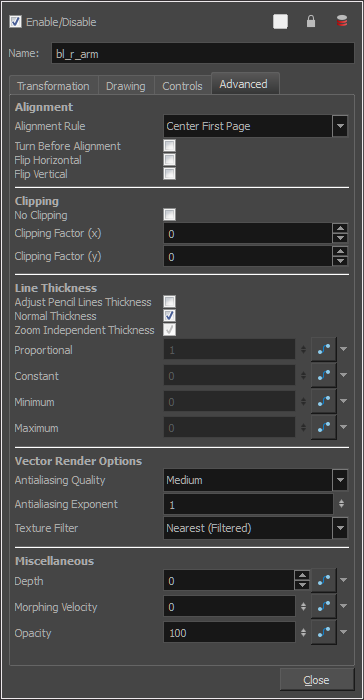 The Advanced tab contains options for setting the alignment of drawings, clipping, line thickness, vector render options, and more. No Clipping: Select this option if you do not want to clip the images in this node before an effect is applied to it. Clipping Factor (X)/(Y): This is an option for rendering images that are larger than the final frame. With this option enabled, images can be moved by an Apply Peg Transformation node without black entering into the composite as a result of early clipping. In addition, this option is useful for images that have a blur that should appear in the frame even though the image itself is not in frame—see Apply Image Transformation Node and Apply Peg Transformation Node. 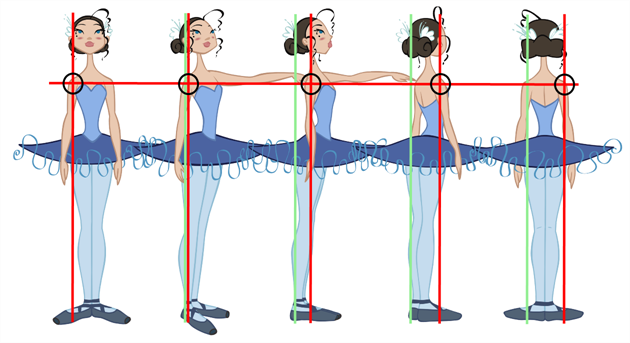 To learn how to use this feature, see Animating the Line Thickness on Camera Move. • Depth: Overrides the order of cables in the node system to determine the forward/backward order in which this element is rendered. The Z position value overrides the depth value. • Morphing Velocity: Creates a velocity function curve for morphing sequences in the layer. This function modifies the interpolation percentage between the 2 drawings. If set, the morphing between the two drawings will not be linear over time between the two drawings but will be modulated according to this curve. This can be used to create a periodic morphing over a long period of time.